In A Vase On Monday is a weekly opportunity to fill a vase using materials gathered from one’s garden and share it through Cathy’s Rambling In The Garden. Juggling a busy schedule today I almost skipped making a vase, but it nagged at me at bit. If Cathy could make the effort while away on vacation I decided I wanted to find a few minutes for one too. For many weeks the red snapdragons planted in the meditation circle have been simply a pleasure, but the color is heavy for this time of year. I purchased them last October at a greatly reduced price. The dark color, perfect as winter was coming on, now seems too rich and velvety for spring. That said, there is little else to complain about. The snapdragons overwintered beautifully and are quite long-lasting indoors and out. I collected about 2 dozen of them for today’s vase and also added a few sprigs of white Dianthus to try to brighten the arrangement a bit. For the container I finally settled on a red pitcher with white hearts, a sweet gift from my late mother-in-law after she saw me admiring it in a kitchen store oh so many years ago. I took several pictures outdoors on the back porch to try to capture the contrasting colors better, but my camera battery ran out before I could experiment much. I am glad to have the flowers to enjoy this week. This entry was posted in garden and tagged Antirrhinum majus (Snapdragon), Dianthus, flower arranging, flower design, garden photography, in a vase on monday, nature photography on May 4, 2015 by pbmgarden. Susie what a beautiful vase….deep rich colors. I love snapdragons! Thanks Donna. I’ve come to love them too this past year. I love the rich colors but I see your point about them having a heavy look. Last summer I had a few dark snapdragons come up next to some chartreuse foliage. I was surprised by how much I liked the combo! Oh, yes. I bet the chartreuse would be able to stand its ground with this red. I usually pick my snapdragons before the flowers are open all the way up the stems and once picked not many more open so they seem more airy because of the tight buds instead of flowers. I love the rich colour of yours and it is good to have a change of style sometimes. Mine were in the ground all winter but the buds didn’t open until the weather warmed up. The pitcher is lovely, what a kind MIL. Thanks for the tip about picking the snapdragons early. I can see how that would give the arrangement some space. I went the other direction and packed several dozen together. Mine didn’t bloom during the winter either, but rebloomed after warmer weather. It was so cold though I admired how the plants survived. I love the velvety red richness of your flowers. They are perfect for a vase and the white Dianthus to set them off was an inspiration. . I haven’ t grown Antirrhinums for years but your arrangement has made me want to. Thank you. During the past several years I kept admiring Antirrhinums in fellow bloggers’ gardens, so was primed to try them when I stumbled across some at a discount last fall. They have been enjoyable. Beautiful colours, lovely vase! Have a great week, Susie! Thanks Anca. Hope you enjoy the week also! The dark red is really quite lovely – they look like they are made of red velvet! I love Snapdragons in my summer pots, but usually the colours on offer are more pastel shades. I can’t keep them over winter here – occasionally one might reappear if planted out but does not then flourish. 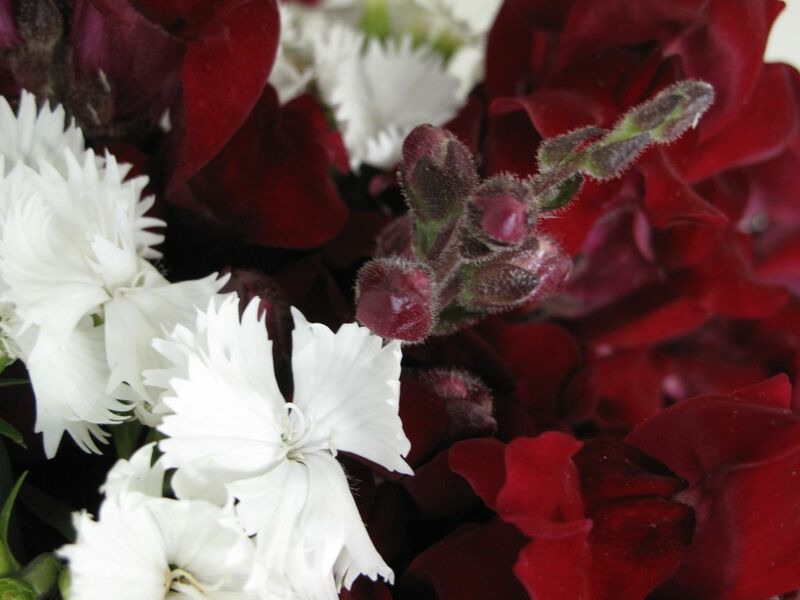 The spots of white from the Dianthus lighten up the arrangement nicely. They are velvety, aren’t they? I’d love to have pots of pastel snapdragons all summer, but it gets too hot for them around here. I’ll have to pull them out at some point along with the pansies. Really sumptutious Susie, the snapdragons are so rich and dark, I haven’t grown these flowers for years and remember pastel shades but nothing so lovely as yours. Thanks Julie, I appreciate that. This dark red was difficult to photograph but in person the flowers actually are sumptuous. I’m enjoying them. I always plants snapdragons that I buy as young plants from the garden centres. I don’t think I have ever seen such a gorgeous colour as yours though. I love red and these are a most delicious red. I think I would be happy to have them at any time of the year. Next year I am hoping to grow more seeds having purchased my little grow house so maybe I can get colours I choose rather than what is available. Lovely vase – thanks for sharing. Thanks Annette. The range of colors at garden centers is very limited here also. These were a lucky find. Growing your own is a good solution. I don’t grow things from seeds often unless I can toss them in the ground directly. My seed growing has been very limited up to now too. I usually grow sweet peas and poppies and last year I tried coriander. Utterly lovely. Never use one red if you can use six is my motto. I want these on my desk NOW! 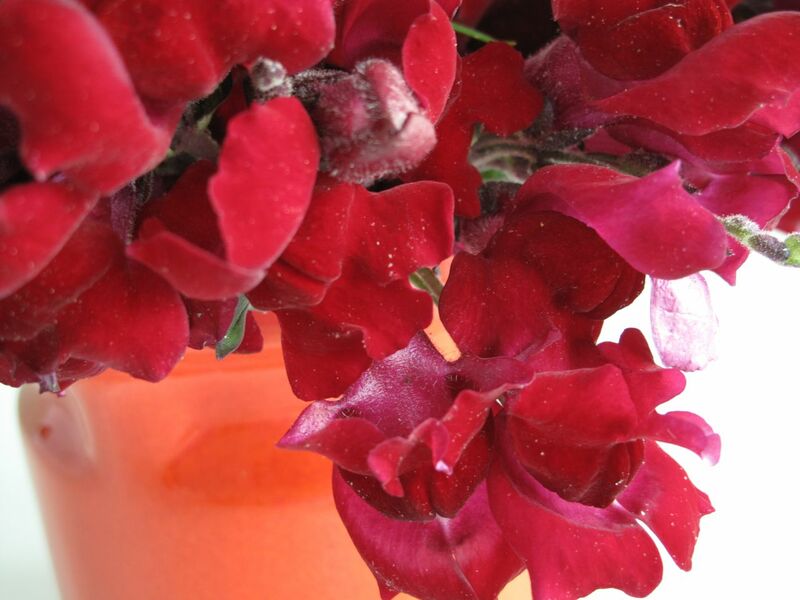 Ann, I felt the photographs didn’t do the red snapdragons justice, so I wish I could bring them right over to you. Such gorgeous, bold, lush colors…Such a wonderful way to start the day. Hi Charlie. Thanks so much. 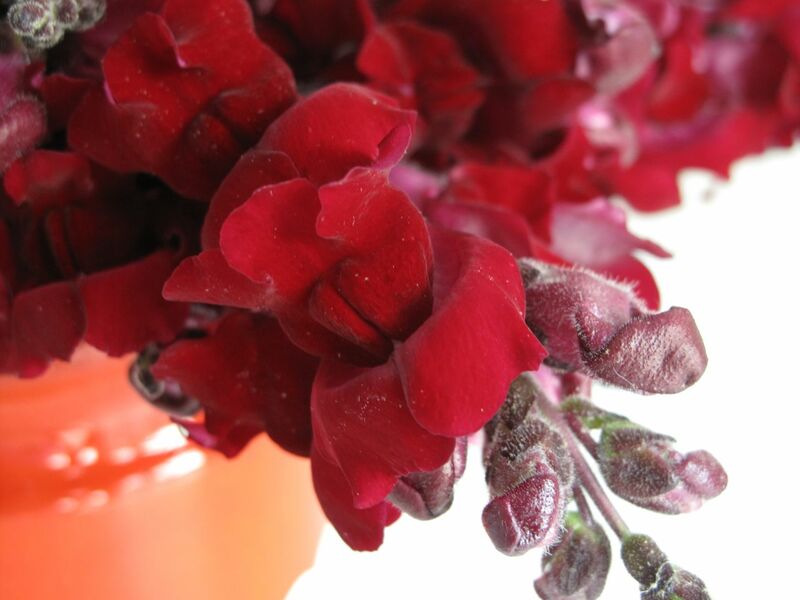 I may try other colors of snapdragons next time but this deep red is compelling. 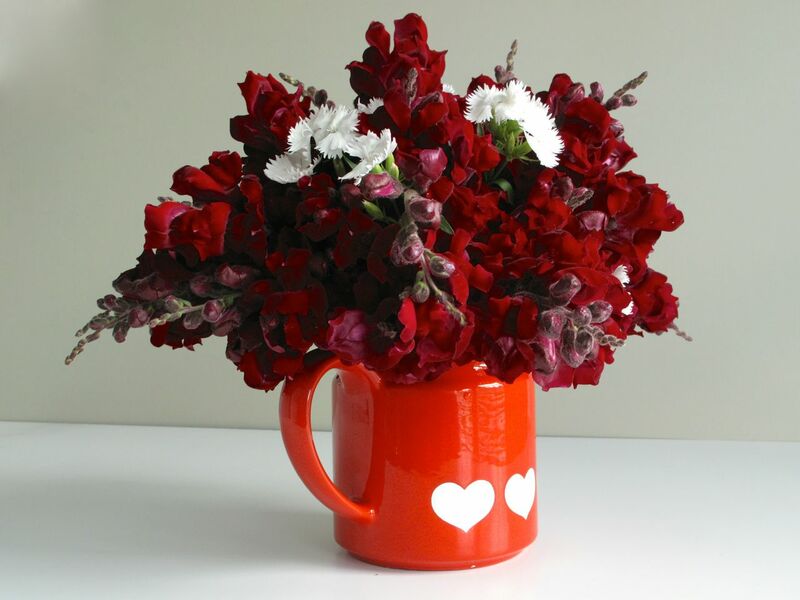 I really think snapdragons are one of the best flowers ever! So versatile, so many colors, and so dependable ! I planted lots last fall and had a few flowers, then with the winter they looked almost totally dead. But never fear! They have come back taller and stronger and more beautiful than ever. I really like the dark reds, but agree that mixed with some white they are even better. Enjoy the nice warm weather! The very warm weather, right Libby? Wow, what a change from last week. I’m already having to water a few things. Glad you snapdragons did well. You advised me about them right after I planted them last fall and as you said, they made it through winter fine. Good luck with your snapdragons Cathy. They seem to be a lot tougher than they look. 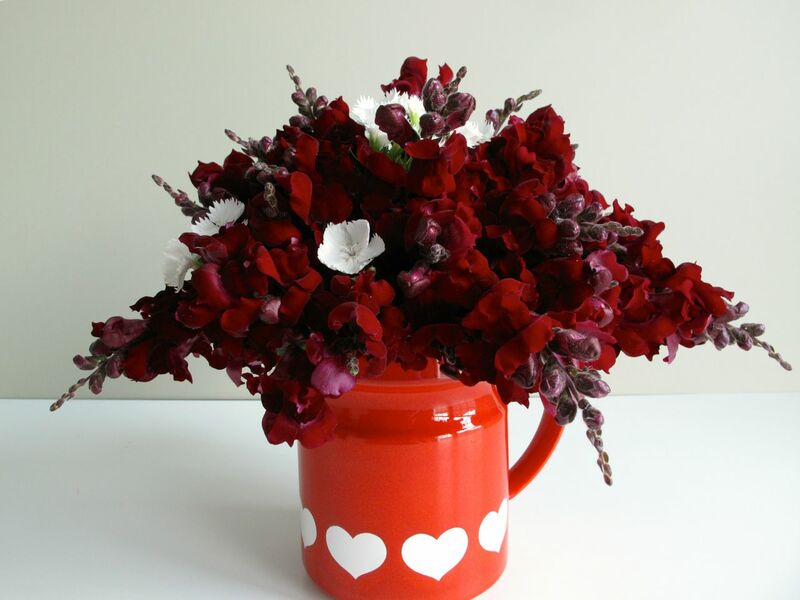 Your snapdragons are such a sumptuous colour and they look as though they are made of velvet! I’ve sown large mixed antirrhinum this spring so I’m prepared to be surprised – hopefully they will be as gorgeous as yours 🙂 Love your heart decorated jug too. Thanks Elizabeth. Your mixed colors of antirrhinum sound lovely. It will be fun to see the variety. I am being educated in the ways of snapdragons – never thought for a minute they would over-winter. 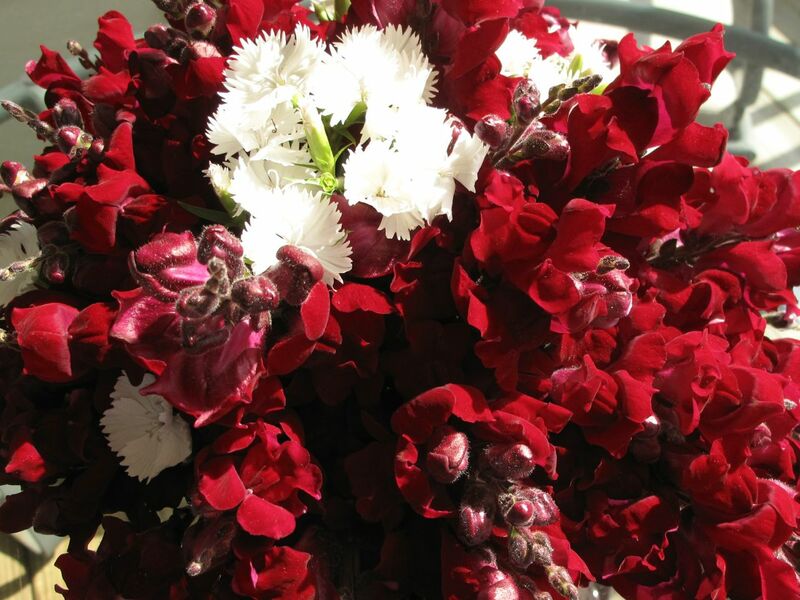 But I loved Christina’s whites last year and your reds are sumptuous. I suspect we might not manage over the winter here, but I’ll have a go! Beautiful vase Susie! Do give them a try Cathy. I was surprised at how hardy these snapdragons turned out to be. It has gotten very hot this week so don’t know how long they’ll last here. I agree….good color but hard to use at this time of year. However to repeat myself: Good color. The heat is picking up here so the snapdragons won’t last much longer. I’ve already bought a replacement but having trouble making myself pull up these brilliant reds.